BM6-HDG4 kit features ACT's most popular Heavy Duty pressure plate. ACT Heavy Duty pressure plates use exclusive diaphragm design to increase clamp load, reduce deflection and maximize clutch life. All diaphragms endure a four-stage, heat-treating process for unparalleled performance. ACT pressure plates have precision cover stampings to provide rigidity and consistency. ACT's 4-pad spring-centered race disc features a spring-center to properly damp torsional vibrations for quieter operation and resist failure even under harsh conditions. ACT spring retainers utilize wraparound spring windows and thicker retainer stampings to provide spring support, reduce stress concentrations, and increase strength and reliability. With the 4-pad spring-centered race disc, engagement is harsher, but shifting is faster. ACT's 4-pad spring-centered race disc is well-suited for smaller disc sizes in smaller engines. 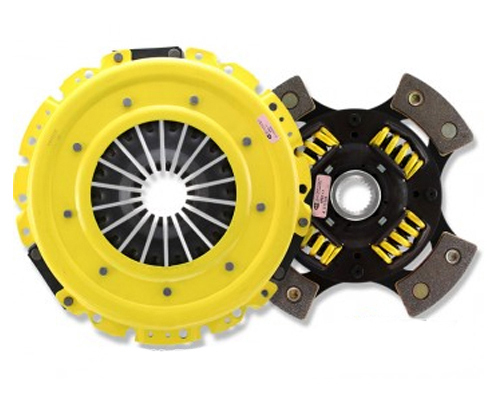 Longer clutch life achieved through ACT's exclusive diaphragm design. Premium ceramic friction materials provide low wear rates and high heat tolerance. All ACT pressure plates are dynamically computer balanced for smooth operation at high RPM. Note: Conversion Kit - Includes ACT Streetlite Flywheel.5 Speed applications only.